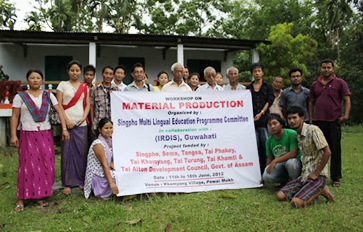 A workshop on the material production for the language documentation of the Singpho, Tangsa, Tai Phake, Tai Khamyang and Sema communities was held at the Buddhist Monastery of Powaimukh at Margherita sub division of Tinsukia district from 11th to 16thof June, 2012. Workshop on ‘a comparative study of the cultural aspects of the Tiwa community of Assam and the Cherokee tribe in the USA’ held at Pobitora Sanctuary in Morigaon District of Assam on the 19th March 2013.The event was graced by ‘Gobha Roja’, King of the Tiwa Community The workshop was addressed by Prof. C.Matthew Snipp of Stanford University and Dr. Deepa Dutt, Executive Director, IRDIS, by Senior members of the Tiwa Community and attended by Tiwa community members including the womenfolk and the youth. A Seminar and Talk on “Immigration and Conflict Resolution”, organized jointly by IRDIS and the Assam Institute of Research for Tribals and Scheduled Castes (AIRTSC) at the Administrative Staff College, Khanapara, Guwahati on 20th March 2013.The talk was delivered by Prof. C.Matthew Snipp, Burnet C. and Mildred Finley Wohlford Professor of Humanities and Sciences in the Department of Sociology, Stanford University, USA. The Seminar was attended by Assam State Government officials, scholars and researchers, members of NGOs, members of the various ethnic communities and their Council heads. Talk on the “The Colonial Legacy of Race and Ethnicity in the United States” was jointly organized by IRDIS and the Indian Institute of Technology (IIT), Guwahati, at the Department of Humanities and Social Science, IIT, Guwahati on 22nd March 2013. The talk was delivered by Prof. C.Matthew Snipp of Stanford University, USA and was attended by faculty members of IIT, Guwahati, scholars, researchers and social scientists. Field Visit to the Nyishi village at Chari Duar in Sonitpur district of Assam on the 24th March 2013. Interaction and discourses held between members of IRDIS and the Nyishi community on areas of history, culture, traditions and rituals and social issues of the community. An interaction session between members of IRDIS and the faculty members and students of the Tezpur University, Sonitpur, on 25th March 2013 was held at the Department of Cultural Studies, Tezpur University. The event was attended and addressed by Prof. C. Matthew Snipp of Stanford University, Dr. Deepa Dutt of IRDIS, Senior Faculty members, students, scholars and researchers of Tezpur University. The signing of the Memorandum of Understanding between IRDIS and the Institute of Research for Tribals and Scheduled Castes (AIRTSC) Assam. The MoU was signed on the 3rd April 2013 at the Conference Hall of the Office of the Minister for WPT&BC, Dispur, in the presence of Sri Rajiv Lochan Pegu, Hon. Minister for WPT&BC, Govt. Of Assam, Sri Jitesh Khosla, Addl. Chief Secretary, Govt. of Assam, Executive Council members of IRDIS and officials of WPT&BC and AIRTSC.